We carry below an abridged translation (kindly made by Thi Minh Ngo) of a scholarly article published in 2007 by Michel Favre-Felix in Nuances, No 38-39, the Journal of ARIPA (Association Internationale pour le Respect de l’Intégrité du Patrimoine Artistique). Publication of the article – which was critical of the Louvre’s recent restoration of Veronese’s The Pilgrims of Emmaüs – prompted an interview with Mr Favre-Felix about the restoration’s problems (“Methodology should be rethought”) in the December 2008 Le Journal des Arts. On 4 September 2009, again in the Journal des Arts, the campaigning work of ARIPA and its journal Nuances were praised by Roland Recht, a member of the Institut de France, art historian and professor of European culture at the Collége de France. Prof. Recht deemed ARIPA’s campaigning to be as important to the preservation of the artistic heritage, as the protection of human rights is to the dignity of humanity itself. On 15 September 2009, the French newspaper, Le Figaro deplored the recent restoration of The Pilgrims of Emmaüs in forthright and unequivocal manner: “A masterpiece victim of an unfortunate restoration”. 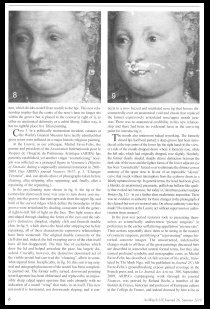 This reception of the Nuances article may have panicked Louvre Museum staff: shortly before the 17 September 2009 opening of its “Titian, Tintoret, Veronese” exhibition, the Louvre made an unprecedented covert re-restoration of the Veronese. This (clumsy) second attempted “improving” intervention compounded the earlier error. The additional changes to the face of a principal figure were noticed by Mr Favre-Felix – who further discovered that no account of them had been entered in the picture’s dossiers. Veronese painted The Pilgrims of Emmaüs around 1560, for a now unknown family. The painting was later brought to France where the prestige of Veronese was growing, and acquired by Louis the XIII in 1638. Epitomising the 17th century rivalry between the French and Italian school of paintings, The Pilgrims of Emmaüs was exhibited side by side with the 1661The Family of Darius by Charles Lebrun. Unfortunately, in 1682, Louis the XIV scaled the two paintings to the same format in order to exhibit them as perfect pendants in the Salon of Mars in Versailles. The Family of Darius was reduced by one third, while The Pilgrims’ canvas was enlarged on its two sides and a large band of about 50 centimetres was added at its top (see fig. 1). These additions were surely executed by Lebrun, the royal painter, who also made overpaints on the original Veronese sky in order to incorporate the band added to the original painting. During the 18th century the picture underwent a cleaning and a relining. As time passed, its surface was dimmed by several layers of varnish and was probably retouched. 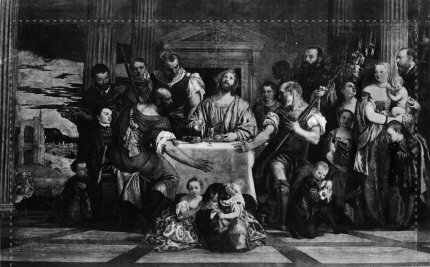 In 1940, the decision was made to recover Veronese’s original composition by removing the enlargements. In 1950-51, during a second stage of restoration, the excess varnish was thinned out and Lebrun’s no longer necessary overpaints on the sky were largely removed. But the restorer, Pierre Paulet, also made changes to the cloak worn by Luke, the Pilgrim seen from behind. Paulet judged the neckband on the garment to be an overpaint “from the 19th century”. This area was visibly mediocre in execution and suspect in its appearance. Without justifying his dating, Paulet removed the neckband and further exposed the back of the Pilgrim, as well as the neck of his white shirt (see figs. 3 and 4) which, oddly, he dated to Le Brun’s time. 1) The neckband could not have been entirely a 19th century addition because it was already recorded in the earliest known copy of the painting which was made before 1710 (see fig. 2) . A comparison of the copies made before 1833 and the copies made after 1869 (see fig. 5) shows that, during this period, the drapery on the shoulder had been seriously altered. If this alteration had been made to conceal an injury (or a first attempt of cleaning) it might explain why Paulet erred in judging the entire passage a “19th century restoration” that should be removed. 2) The collar of the shirt discovered could not be of Le Brun’s time. One cannot imagine circumstances in which this shirt had been added in 1661 by the King’s painter (Le Brun) only to be concealed a few years later by the addition of a neckband (recorded in a copy before 1710). 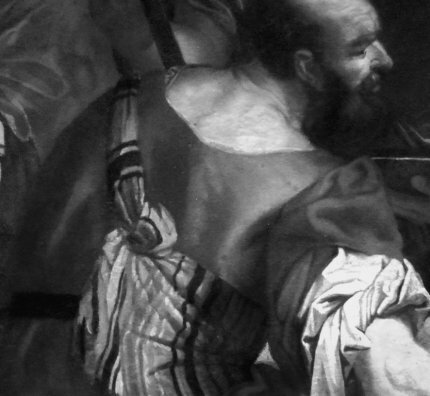 The shirt collar must be considered – in the lack of contrary evidence – to be from Veronese’s time. But that is not say that it was evident in the final version of Veronese’s painting. It might have been a temporary step that the artist himself had finally covered with the neckband which appears in all the known copies. The alteration in the 19th century may, thus, have induced a misunderstanding of the situation by Paulet. What is less forgivable is that the Louvre’s own laboratory technicians and art historians should neither have noticed the dramatic changes that appeared in this area during the 19th century, nor paid attention to the clear testimony of the copies. Instead, they simply repeated, in their own files and in their own publication, errors of dating, and failures to recognise material inconsistencies. It would, however, seem that although being without a complete understanding of the issue, the choices made by the restorer in the 1950’s were not guided by a desire systematically to “purify” the painting from all earlier interventions. To the contrary, Paulet was respectful of what he deemed to be overpaints of good quality. 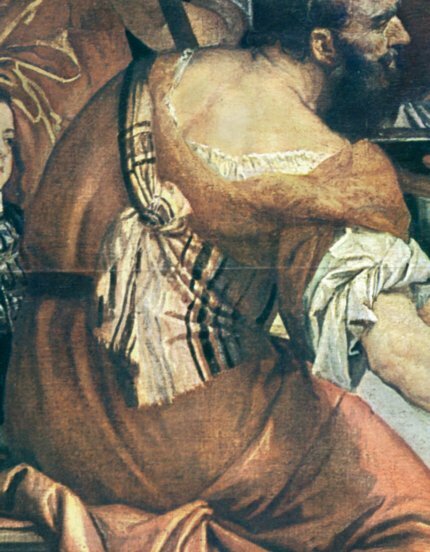 In particular, he preserved all the folds on Luke’s garment, just as he did for those that enliven the dress of the mother, although he had judged them to be additions from “the 19th century” (once again, an erroneous dating, as can be shown by examining older copies of the painting – see fig. 6) . The restoration decisions taken in 2003-2004 were far more radical: the folds on Pilgrim Luke’s back were completely removed (see figs. 7 and 8). What were these folds made of? The analysis was incredibly summary. Only two samples of paint were analysed – and only one of which revealed a so called “brown glaze” on its upper layer. This brown material was impossible to date. 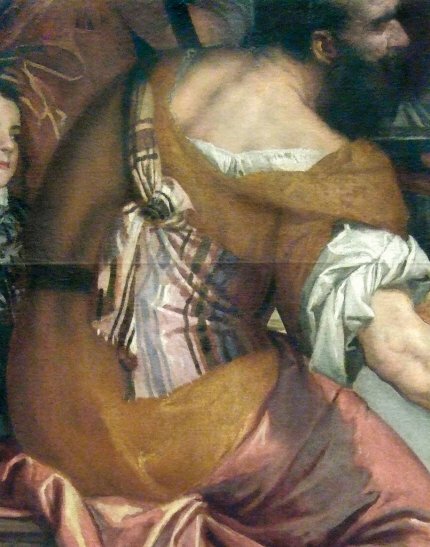 Nonetheless, convinced by this limited and ambiguous result, the Louvre decided that the whole folds were overpaints from an earlier restoration and that they should all be removed, without discrimination, even though – as was clear from the first attempts at taking the folds off on test areas – there was no original drapery to be found underneath. What did this removal of paint reveal? Nothing more than a severely degraded surface in which only abraded remains of Veronese’s pigments remained in an eroded paint layer deprived of the forms and colours that the artist had conceived and applied (fig. 8). Even if one had been convinced that these folds were added during previous restorations, the question would arise whether these additions were not meant to replace original folds that had been damaged. At any event, the folds removed were similar to those visible in all the old copies of the painting, which serve as historical documents of reference . We shall no longer have any chance to admire this work, and – what is worse – we must now suffer an incongruous overpaint added in our early 21st century. At present, a hazy and brownish arc sweeps down Luke’s back, roughly following his spinal column. His flattened garment is underlined on the left by a shadow as feeble as it is indistinct (see fig. 9). According to those responsible, writing in Techné (p. 46), “this reintegration [which is actually a complete invention – M. F.-F.] evokes the missing folds by means of retouches vibrant in their facture and drawn with suitably incisive strokes.” These “vibrant” retouches – in fact pitiful – follow none of the few faint traces of the drapery once painted by Veronese that could be discerned after the folds were removed (fig. 8). In breach of all deontological rules, these modern overpaints have no basis in any documentation and give a deceiving impression of the artist’s work, which totally misleads the public. No viewer could ever guess that these new overpaints “evoke missing folds”. The family mother underwent a treatment yet more unbearable. Figure 10 is the last photograph (of very average quality) that records the state of the painting at the start of the cleaning. Figure 11 shows the state of the picture after the varnish and older retouches were removed. The lacunas, where the original material is completely missing, are circumscribed and covered with white mastic. Already at this stage, one can notice a surprising weakening of the composition. The left eye of the mother has lost the fine eyelashes – on the edge of the upper eyelid – that gave her glance its expression. Her eyebrows have faded, as if they had been plucked. The vigorous and sensual line that separated the wing of the nose from the cheek has been liquefied. The subtle line that formed the slight double chin has disappeared to give way to an improbable swelling. Figure 12 shows an incredible transformation. The shape of the nose, noble and harmonious, was already blurred by the cleaning. It is now completely distorted by the retouching, which unscrupulously transformed the original shape into the turned-up nose of a starlet with a mutilated nostril. The space between the nose and the mouth has become a shapeless and dubiously grey zone. 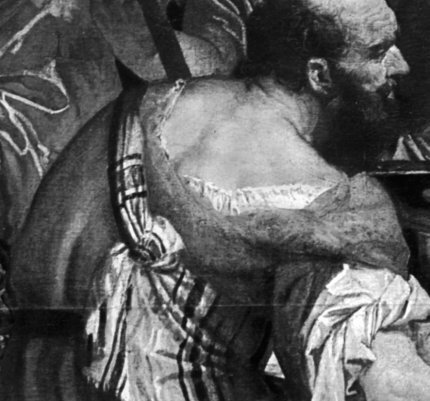 The mouth has been entirely painted over without any respect for the drawing of Veronese. Crossed by a hesitant black stroke, the mouth is now ludicrously small and soppy (note the small and clumsy “V”). Finally, the charming double chin has disappeared to give way to a goitre-like neck and a bloated, pinkish, and heavy cheek, which gives the eye a porcine aspect. In sum, the Venetian mother, with her noble and mature features and slightly melancholic look, has become a caricature of a 21st century adolescent with her awkward pout, her stiff expression, and obesity a-waiting. This aesthetic manipulation is all the more grievous since the character of the mother is crucial in the composition intended by Veronese, who had painted more than a mere portrait of Venetian women. With her noble face and meditative look, this mother, carrying her newborn with his golden locks, evidently symbolised the Virgin Mary and Child. Protecting the little boy behind her cloak, she evokes the “Vierge de Miséricorde”, who appears frequently in sacred iconography since the 13th century. Her husband stands behind, in an unassuming position attributed to Joseph in images of the Holy Family. Only recently have art historians begun to understand that the profane splendour of Veronese’s paintings, which has been emphasized till now (e.g. Les Noces de Cana), has profound religious significance . The reference to Mary is essential to allow the co-existence (indeed anachronistic), within the same compositional space, of this Venetian family pictured in its everyday surroundings, with the Christ in action during biblical times. In Veronese’s conception, the mother directly echoes the figure of the Christ. If one had any idea of the religious reflections that inspired this painting and of the sense of the imperatives of decorum that constrained it, this face could not have been altered in such a disastrous manner. The current restoration pretends to be wary of any creative intrusion. 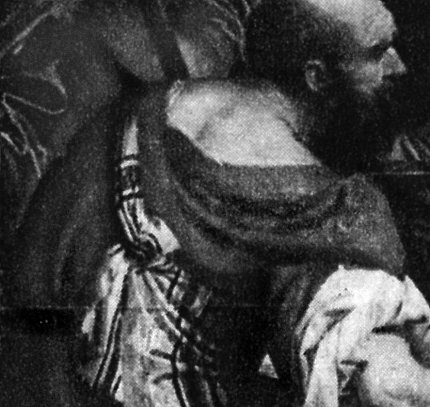 It is in the name of objectivity that all the folds that enlivened the dress of the mother were removed – without any supporting analysis of any kind – with the same goal of purification that guided the intervention on Luke’s cloak, leaving in its stead a flat, modern and abstract surface (see figs. 14 and 15). The outcome demonstrates a total disregard for the evidence provided by historical documents, all of which corroborate the existence of the folds (fig. 13). The 2003-2004 restoration deserves to be presented as a case study to students training to become curators and restorers. It displays variously: the uncontrolled removal of paint without any critical evaluation; fetishistic attachment to the sole original material however ruinous its state with no regard for the historical and aesthetic value of the work; dating errors; and, falsifying retouches. These failings and their effects on the painting are blatantly clear. Yet, no member of the restoration committee raised any objection. It is chilling to think that the same “methodology” – purification and retouches – produced the same results on so many other paintings, in so many parts of their composition, without raising any more questions. This study had not aimed to create a “controversy”, to use a museum circle’s term, in the sense of an “uncertain dispute”. 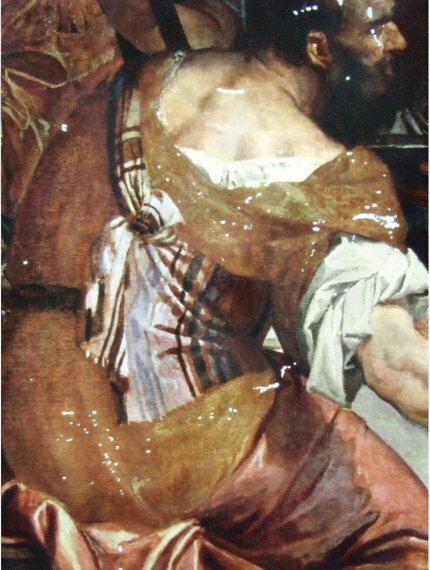 There was no basis for presenting “contra” and “versus” positions, for I had worked on data and documents obtained from the Louvre and Versailles archives and from the scientific files of the restoration centre, adding my own research only on the subject of old copies of the Veronese painting. One should notice that although the restoration work had been done under the guidance of the C2RMF (Research and Restoration Centre of the French Museums) for the Louvre, the museum’s own curators and restoration commission had accepted the result. 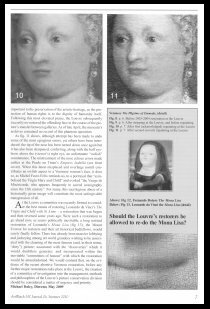 The Louvre, and the C2RMF even more, were understandably not pleased by this publication, but had no grounds for disputing the facts as I reported them. On the contrary, the necessity of some day correcting this unfortunate disfiguring was a point of agreement in the discussion I had with the Louvre, even if the painting was still hanging in its pitiful state two years after my publication. It was surprising, therefore, that someone in the museum had had the idea of using the occasion of the Louvre’s own exhibition “Titien, Tintoret, Véronèse”, to re-work the painting, as if in a hurry, during the few days when it was taken down prior to the exhibition opening on the 17th of September 2009. The main re-retouching that took place focused on the mother’s face. In my knowledge, this is the first time that a French museum has made so concrete an acknowledgement of the force of criticisms of a restoration as to re-restore the painting itself. On discovering this second intervention during the course of the exhibition, I was shocked by the clumsiness of the attempt to repair the previous disastrous repainting. I asked the C2RMF if I might see the documents about the second restoration because they are generally in charge of the restoration of the Louvre paintings. They said that they had nothing new in their file (as I myself checked), because they had not been involved in what they characterised as a “localized intervention [that had been] requested and followed” (their words) by the Louvre’s curator for this painting, Jean Habert. When I consulted the dedicated file in the archives wherein all interventions on the painting have to be reported, I discovered that no record had been made of the second repainting. When the arts journalist, Dalya Alberge, asked for explanations, the Louvre spokesman stated that in this second operation had consisted of the painting being merely “scrubbed up” (“bichonnée”) when that is a term normally used for very light interventions (such as dusting or retouching a minor scratch unnoticed in the museum but detected on a closer inspection made before an exhibition, etc). As for the result of this further repainting, the previously messed mouth has been blurred, not corrected. The nose had been given an awkward point and a baffling enlarged new nostril, while the cheek remains puffed. This remains another alien 21st century version and, as such, it further dishonours Veronese’s painting. My latest request to the Louvre has been for this re-repainting to be fully documented in their files, according the international museum’s standards and ethics. As an association we also pointed out officially to the Louvre’s authorities, the necessity for these successive “restorations” to be undone and the intervention to be rethought from the beginning. Presently kept at Versailles, it is as large as the original. These dimensions (a very rare 1/1 scale) permit to identify it as the copy n°849, of similar dimensions, in the Inventory of the King’s Paintings set up in 1709-1710 by Nicolas Bailly. So, it was made after 1682 (since it includes the enlargements) and before 1710. These folds are clearly shown in the engraving by Simon Thomassins, in 1742 in the Recueil d’estampes d’après les plus beaux tableaux …du cabinet du Roi, de Crozat, Mariette et Basan (fig. 6). That is, the copy of the painting in Versailles (see fig. 2) and the engraving by Thomassins made in 1742 (see fig. 6). See for instance Richard Cocke, Paolo Veronese. Piety and Display in an Age of Religious Reform, Ashgate, 2001. Above: fig. 1, the state of the Veronese before 1940. The dot lines indicate the original surface and, beyond, the 17th century enlargements. Click on any of the images for larger versions. NOTE: zooming requires the Adobe Flash Plug-in. Above: fig. 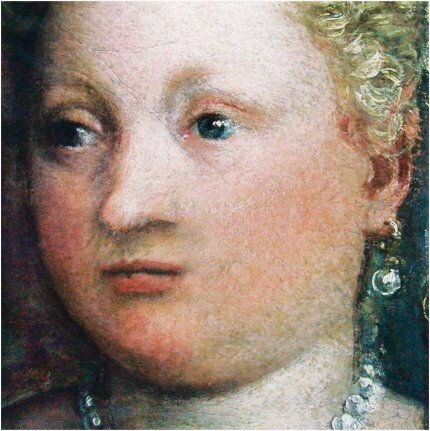 2, detail of the earliest known copy, made after 1682 and before 1710. Château de Versailles [inv. MV 8098]. Above: fig. 3, detail of the Louvre original, before the1950 intervention. Above: fig. 4, detail of the Louvre original, after the 1950 intervention. Above: fig. 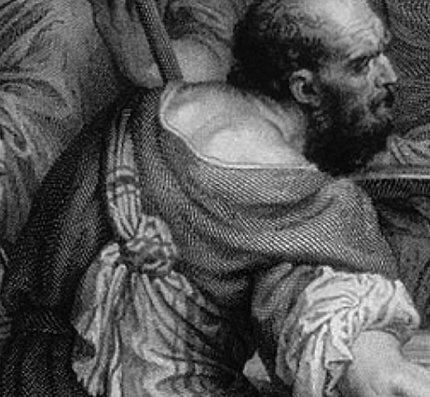 5, engraving of 1869 (detail). Above: fig. 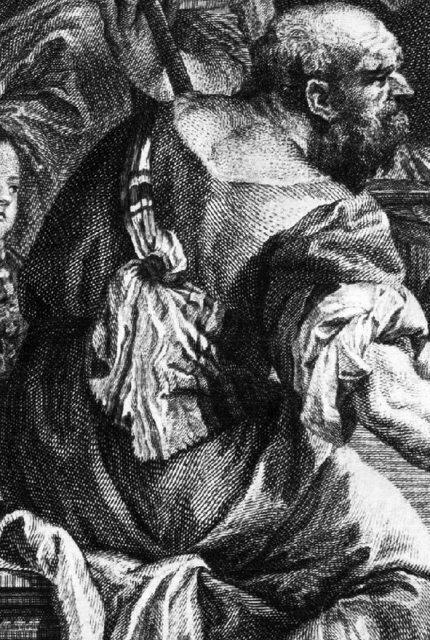 6, engraving by Simon Thomassins, in 1742 (detail, reversed view). Above: fig. 7, after the 1950 restoration. The collar of the shirt is “discovered”, but all the folds on Luke’s garment have been preserved. Above: fig. 8, after the 2003 cleaning (and before retouching). All the folds have been suppressed, showing nothing more than a severely degraded underlying surface. © Photo C2RMF – Eric Dupont. Above: fig. 9, after the 2004 “vibrant” retouches. Above: fig. 10, The Mother, as seen just before 2003. © Photo C2RMF – Gérard Dufrêne. Above: fig. 11, the half-way state in 2003, “cleaned” lacunas filled with white filler, but no retouches yet. © Photo C2RMF – Eric Dupont. Above: fig. 12, the final aspect in 2004, after retouching. © Photo C2RMF – Eric Dupont. Above: fig.13, a detail of the 1742 engraving (reversed view). Above: fig. 14, a detail of the original, before 2003. Above: fig. 15, a detail of the original, after 2004. Below, figs. 16 and 17, ArtWatch UK Journal No. 26, pages 6 and 7. This entry was posted on December 29, 2010. It was filed under blog.